If there was space left on the GUI, we'd slap the following on this super-powerful effect: "Warning: Serious delays ahead!" Great presets and fantastic sound. Sidechain ducking. Help function. LFO track position synchronisation. Great filter section. Highly flexible. 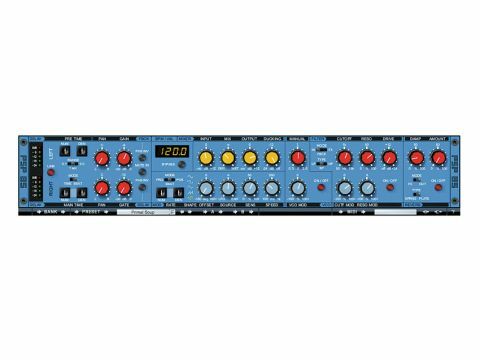 If there's one effects processor that we never get tired of tinkering with, it's the delay processor. Whether we use it to add a dash of chorus-like character, create an unexpected musical riff, fill out some space in a mix as an alternative to reverb or simply make things sound utterly bonkers, a good delay unit is your trusted production partner. Seven long years have passed since we first tried PSP 84. Too often dismissed as simply a dual-channel version of the PSP 42 (which is based on the classic Lexicon PCM42 delay unit), PSP 84 was actually a far more powerful beast, with a plethora of additional features. "The PSP 85 feels and sounds like a robust, old-school bit of kit - but one with futuristic innards." Highlights included the vastly enhanced filter section, which offered a powerful filter (band, high or low-pass) that could operate on either the input, the feedback section or just the delay effect section. The resonance could be cranked up to self-oscillation, and five different types of tempo-syncable LFO waveform were on hand to be added to the already pretty crazy proceedings. The ability to switch the filter to process the input, feedback or overall signal was always worth trying too. Bolted onto this was a reverb section, offering plate and spring modes, which could be placed on either the entire signal path or just the effect signal. This was closely followed by some saturation features to offer a warm-to-squashed effect. Oh, and one of PSP 84's best features was its ability to adjust and modulate the 'speed' of the delay line, just like a tape delay - enabling the production of everything from subtle wowing to crazy pitch-bending effects. All of these features are present in PSP 85, and they still all sound pretty amazing, are in no way obsolete and should constitute part of PSP 85's appeal to new users. Of the new features, one of the most interesting is sidechain ducking. PSP 85 can use either an external source (host permitting, which most do these days) or the input signal as a key to attenuate the effect signal. Thus, the echoes will become quieter whenever there is input, but will rise in volume to 'fill the gaps'. In theory, you could achieve this in other ways, but having it built right in is a great convenience. Another neat new feature is the delay line panning, which is independent for each channel, as is the delay gate, which mutes the delay when it drops below a certain level. The latter is great for taming runaway delays, or simply making them punchier and more obviously rhythmic. And the pre-delay at the delay input stage offers yet further sonic control. Again, these features are all things that can be achieved (after a fashion) without these controls, but the convenience makes them an excellent addition. Some of the new features can't be achieved by other means, though, such as the filter resonance modulation and the track-position LFO synchronisation. The latter function means that with some of the crazier evolving effects, you can be sure that things will always sound the same upon each playback. This is most welcome, as some plug-ins have reduced us to tears when the best effect sequence we'd ever heard suddenly popped out of the LFO-driven chaos, never to be repeated. As you'll have gathered, PSP 85 isn't your average delay, and to really get a grip on what's going on under the hood, we recommend taking a look at the manual, which includes a block diagram of the signal path. With a plug-in that's home to as many interactive parameters as there are on PSP 85, getting the exact results you're after can often be a bit hit and miss. So much so, in fact, that even experienced engineers can sometimes need to take a step back and partake in a thoughtful head scratch as they try to get the most out of a good complex delay unit. This is where the presets come in. PSP have done a really great job of offering a hugely broad selection, with patches suitable for mangling a drum loop, phattening a synth riff, creating crazy breakdown effects from the sound of one hand clapping and loads more besides. Whatever your musical bag happens to be, we'd recommend trying out PSP 85 on some random elements using random presets, just to see what it can do. Pretty soon you'll get a sense for what they're all for and thus be able to make some informed decisions about which presets to turn to in the heat of the moment. We won't lie to you: it can take a while to get a good grip on PSP 85. But our golden tip is to try it out on each track of the next project you make, and try five to ten presets each time. Just taken from this standpoint, we were amazed by how much we ended up using it on our tracks. Some of our favourite enhancements are very much on the surface. Each section of the GUI is divided up and labelled, with its own On/Off switch. We highly recommend disengaging each section in turn when working through the presets as it can really transform them (and some presets are a little heavier on the reverb than we'd like). While the slightly cluttered and confusing interface remains as busy as PSP84's (even busier, in fact), the new Help section (marked by a question mark) enables you to hover over a section for a complete list of all the parameters and a brief description of their function. PSP 84's success was down to the clever interaction of its individual sections. It was described by many at the time as being more than the sum of its parts, and this new version really picks up where the last one left off. There's nothing radically new here - just lots of great refinements. Anybody who's got the previous version should at least try the demo of PSP 85 - we suspect that you will quickly see the value in upgrading. PSP 85 feels and sounds like a robust, old-school bit of kit - but one with futuristic innards. It's capable of some astounding next-gen results, but there is a solidness to the sound that feels substantial and vintage. It can produce flanging effects, phasing effects, delay effects, swirling/squeaking effects and everything in between or on either side. It can be a creative tool, an inspirational tool or just a workhorse. Most importantly, it doesn't sound like just another delay. Even if you have ten other delays fighting each other for space in your plug-ins folder, we guarantee that you'll get something fresh out of PSP85 - and that alone makes it well worth the asking price.